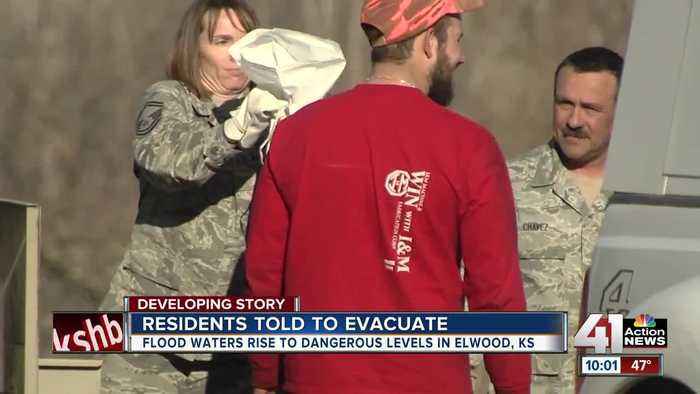 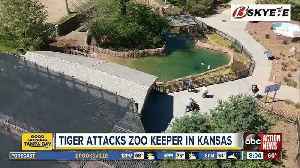 Firefighters from the Kansas City metro spent Thursday getting familiar with Elwood, Kansas in case it floods. MISSOURI, ASFLOODING WORSENSALONG THE MISSOURIRIVER.LEVEE BREACHESFORCED PEOPLE INFOUR MORECOMMUNITIES TOEVACUATE.SOME IN THE WATER'SPATH ARE FED UP. 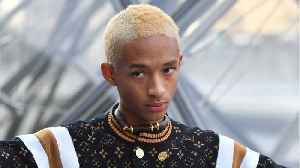 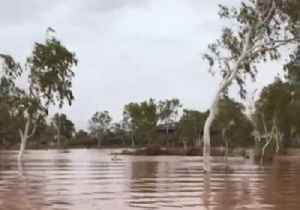 "We can put a man on themoon but we can'tregulate a river? 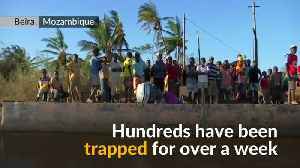 "WE'VE GOT TEAMCOVERAGE AS THEWATERS RISE --CAT REID IS IN ST.JOSEPH --BUT LET'S START WITHANDRES GUTIERREZ,WHO IS ACROSS THERIVER IN ELWOOD,KANSAS.ANDRES -- PEOPLEWERE TOLD TOEVACUATE THERE ASHORT TIME AGO.THEY WERERHIANNON--AND NOW OFFICIALSARE WAITING TO SEEHOW MANY PEOPLEWILL ACTUALLY LEAVE.THESE RESCUE BOATSBELONG TO SEVERALFIRE DEPARTMENTSFROM THE KANSASCITY METRO.THEY'RE STANDING BYIN CASE THE RIVERSUBMERGES THISTOWN.THIS IS ELWOODKANSAS LAST HOPE......IN PREVENTING THEMISSOURI RIVER FROMBREAKING THROUGH...DOZENS OF NATIONALGUARD MEMBERSSPENT THE DAYFORTIFYING THETOWN'S LEVEE USINGSAND FROM K-DOT.TRYING TO SEE WHEREWE CAN GET BOATS INYOU'RE IN WATERTHAT'S NOT MEANT TOIT'S REALLY RUNNINGFAST RIGHT NOW SORIGHT HERE'SACTUALLY A LOCAL MAPWHEN THEY BRING THEGPS' BACK I PULL ALLIT'S PRETTY NICE TOCALL BACK AND CHECKI'M TOLD AT LEASTTWO OF THESE BOATSWILL BE OUTRESPONDING TO CALLSWHEN NEEDED.LIVE IN ELWOODKANSAS. 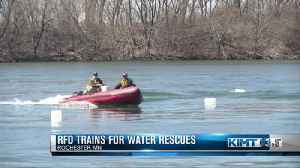 With boating season just around the corner, firefighters in Rochester are brushing up on their water rescue skills. 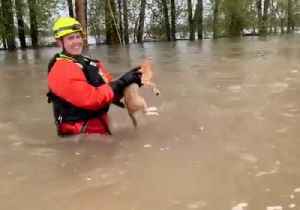 A water rescue team in Salem, Oregon, rescued a cat who was stranded in the high flood waters brought on by the heavy rain in the area on April 12. 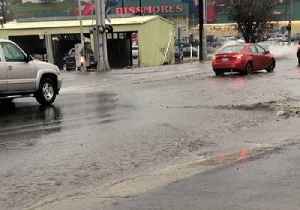 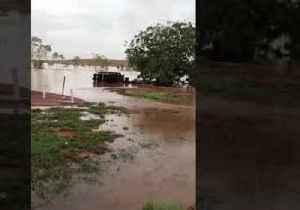 The Salem Fire Department shared footage of the..
Communities in the Pilbara region of Western Australia, were inundated with floodwater resulting from Cyclone Veronica, the Bureau of Meteorology (BoM) said in a tweet on March 28. 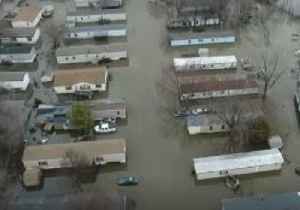 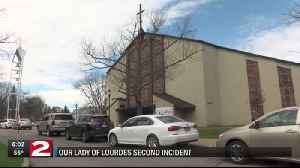 “We have flood..
A large part of Bellevue, Nebraska, remained off limits to the public on Sunday, March 24, more than a week after a catastrophic flooding event hit parts of the state.This drone footage of Bellevue..